Variable frequency drives also optimize motor starting characteristics. Variable frequency drives bring motors up to full speed quickly and by drawing only 100% to 150% of full load amps (FLAs). This ability to start at normal FLA is very important if the power supply cannot withstand the normally six times FLA across-the-line starting draw, or even the 350% FLA soft-start device current. Variable frequency drives do this by managing the magnetic flux of an induction motor. 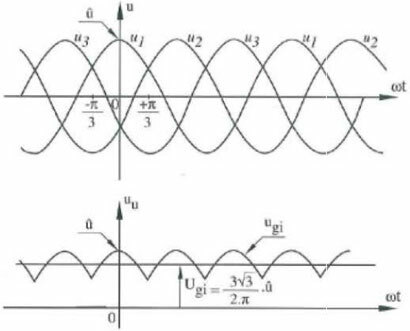 Magnetic flux is directly proportional to the voltage and inversely proportional to the frequency. 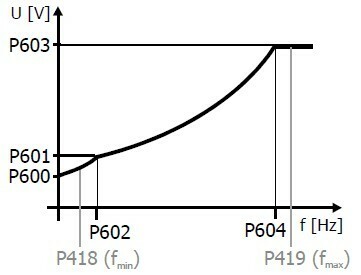 By keeping the flux constant, the inrush current does not exceed the FLA rating of the motor, and full torque is maintained. This is a significant improvement on a soft-start, which has significant voltage drop problems and cannot start under full load. 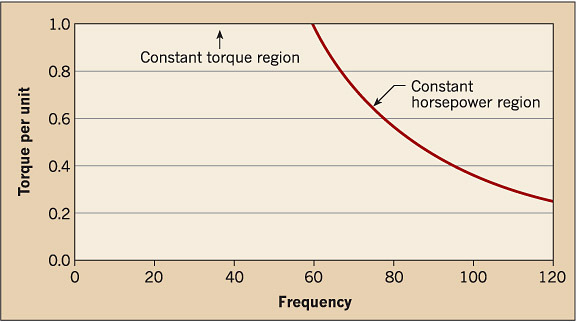 Another potentially useful aspect of variable frequency drives is demonstrated in the following figure, which shows the output of a constant torque variable frequency drive. Notice the two regions, constant torque, and constant horsepower. The constant torque region is fairly self explanatory; the variable frequency drive is regulating the flux so that the current is constant. 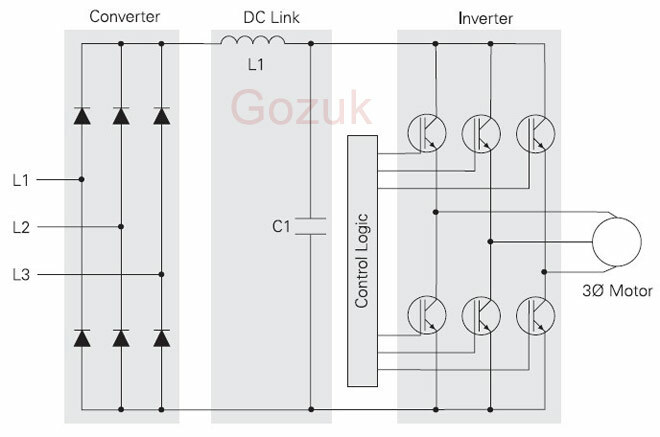 Once the variable frequency drive surpasses the rated system frequency, the voltage cannot increase due to the physical constraints of the system. Because the voltage is static — and the frequency is increasing — the flux is forced to decrease. When this occurs, the current and torque are forced to decrease as well. This is called field weakening. Although not necessarily a good thing, it can be useful if there is a need to power a partial torque load above the rated speed. In addition to this capability, variable frequency drives can also take any form of input power whether it's single-phase AC, 3-phase AC, or DC. Variable frequency drives fed from a DC source still power an AC load without an internal rectifier. Variable frequency drives also have some applications on the power grid. One classic example of this is a doubly fed induction generator, in which the variable frequency drive can force a fixed frequency and voltage signal out of a variable-speed (frequency) input. This is commonly seen in wind turbines and other small hydroelectric generation projects that will be connected to the power grid. Other renewable energy sources, such as photovoltaic cells, can use variable frequency drives to act as an inverter before connecting to the power grid, although inverters with buck-boost technology are more common. While there are many potential uses for variable frequency drives on the commercial power grid, they are beyond the scope of this article. In summary, whenever a load has either a variable torque or a variable speed, a variable frequency drive should be considered. A variable frequency drive might be considered if a large motor has a problem with voltage drop, torque, or inrush current during start-up. 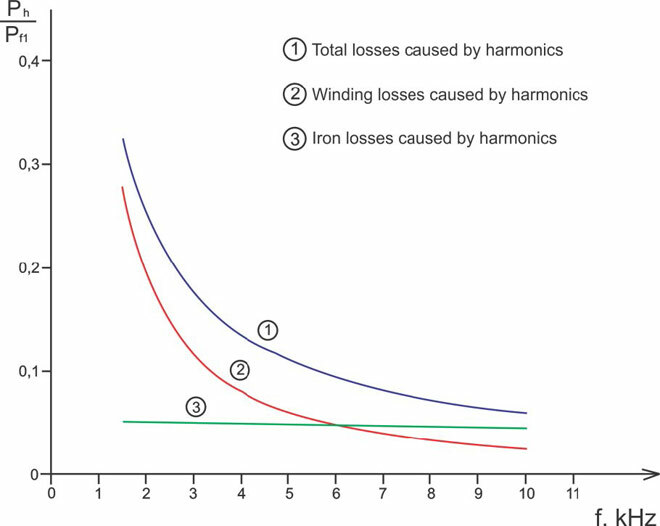 Even though variable frequency drives undoubtedly solve their fair amount of problems and provide substantial energy savings, the heat they generate must be dissipated - and the harmonics they produce must be mitigated.